Buffer Analysis creates buffer polygons to a specified distance around the Input Features. Because at most of time we treat a postcode as a point, its buffer analysis is more like a radius output. If you want to check a buffer range with a specific postcode, here we have a free online tool (Radius from UK Postcode). Just input the postcode, buffer size or the radius of circle, and press 'plot', you will see the result. 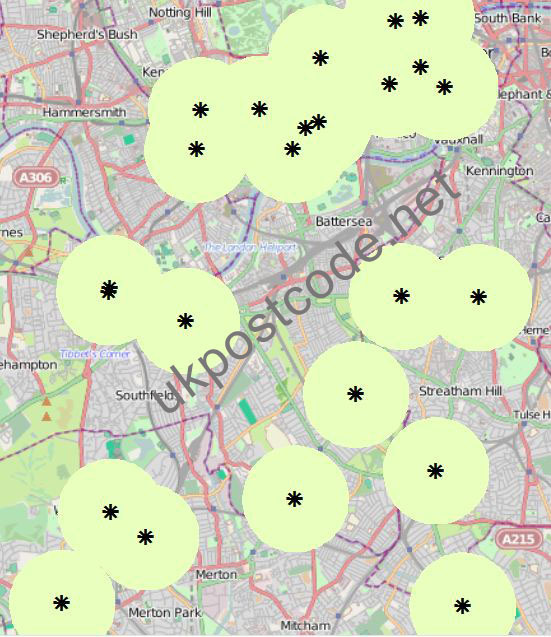 Radius from UK Postcode is quite good, however, a buffer analysis with multi-postcodes will be more useful. For example, the district manager of Lloyds TSB bank wants to know the coverage of their banks in area SW of london with a given radius. How? Well, we don't have an online tool to make it yet, but with ESRI's ArcGIS, it can be quite easy. 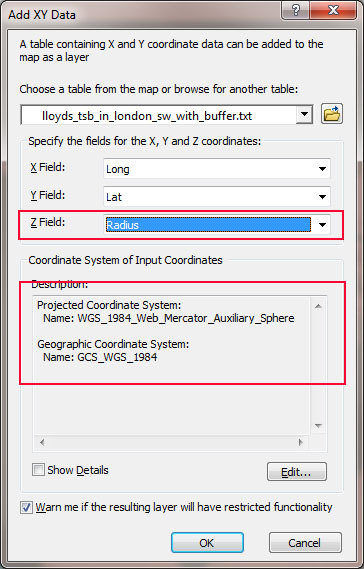 In this article, I will use ArcGIS 10.0 to show you how to do the buffer analysis from multi-postcodes. ArcGIS 10.0 (as of writing, 10.1 is the latest) is not the latest version from ESRI, but it is powerful enough to handle buffer analysis. Actually buffer is a very basic GIS analysis, even the oldest version can do it. ArcGIS 10.0 comes with an amazing feature, which allows user to add a basemap from different remote data sources. This is a perfect function for our this analysis, for we will only just need to provide several postcodes' Latitude and Longitude. OK, let's start! First step, prepare data. Let's take the example above. 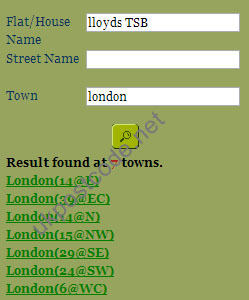 Search keywords "lloyds TSB" in "london" by using our Postcode Finder tool, and it will be 24 results in SW, London (See picture above). Use "Convert UK Postcodes to Latitude and Longitude" to have each postcode's position. Save the results as below. Click to download this file. Please note that radius values' unit is meter. If you want to give each postcode a differnt radius value/buffer distance during buffer analysis, you will have to project these points. Otherwise, ArcGIS can only give these points a same radius value/buffer distance. 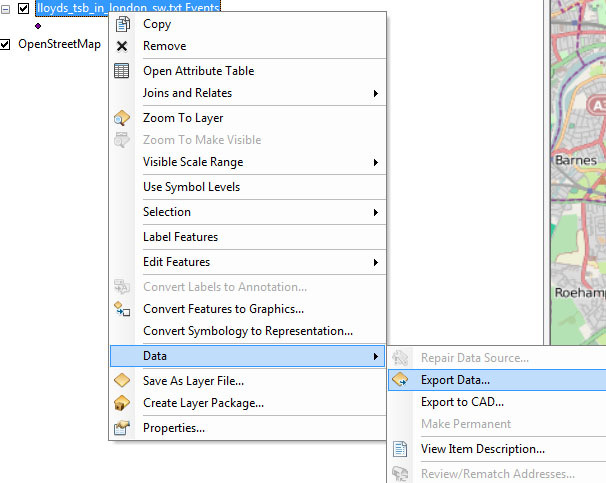 Open ArcGIS, Choose "File" -> "Add data" -> "Add basemap"
Choose "File" -> "Add data" -> "Add XY Data". Select the text file from your local, and DO give it a coordinate information, otherwise it won't show correctly on the map (See picture below). ArcGIS will give you a warning message that imported data doesn't have Object-ID, just click ok and we will solve this problem in next step. After click OK, you will see the points on Map. 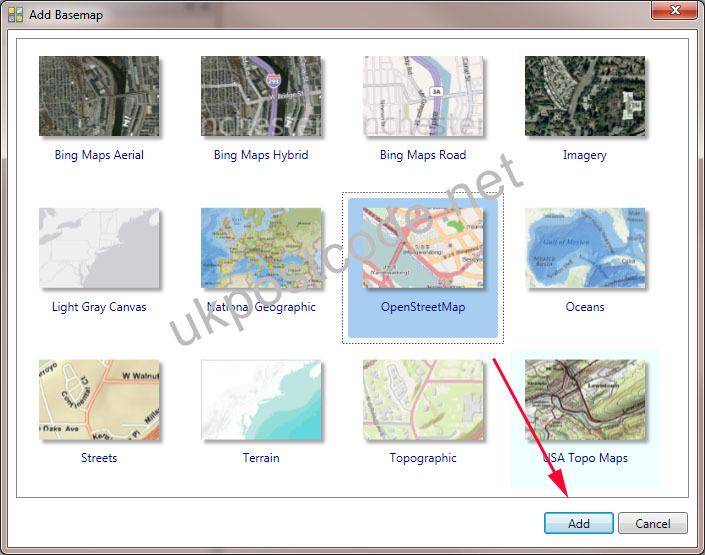 Shapefile is a popular geospatial vector data format for geographic information systems software. Right click on the text layer, which we just imported, and choose "Data" -> "Export Data". Add the shapefile to layers after export. Choose "Geoprocessing" -> "Buffer" (Or you can find this tool in ArcToolbox). Select the shapefile layer as "Input Features", then input the buffer range "Distance" or select one defined field. Only a few seconds, you will have the result. Below is the result based on 1000 meters radius (left picture) and that based on the field "Radius" (right picture). 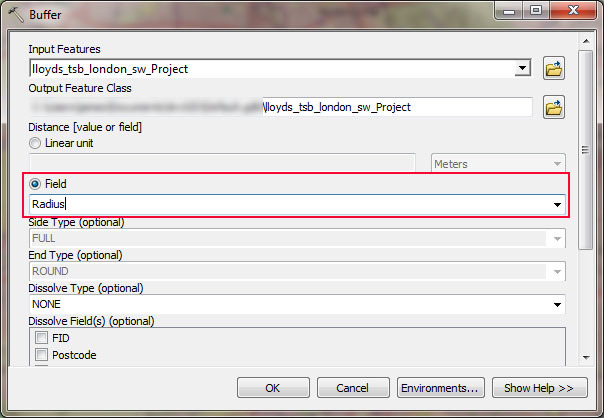 Instruction above can teach you how to make buffer from UK postcodes with ESRI's ArcGIS 10.0. 1. No other GIS files needed. 2. Capable of handling thousands of postcode points.